CORTE MADERA, Calif.--(BUSINESS WIRE)--Mar. 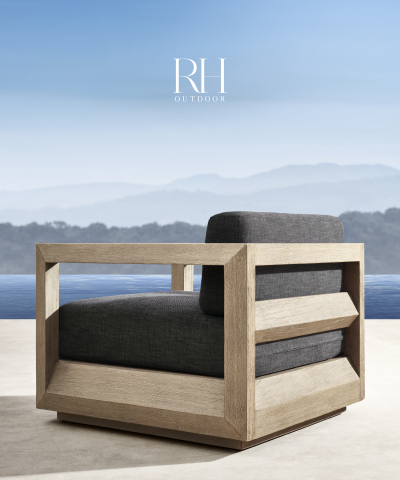 26, 2018-- RH (NYSE: RH) announced today the release of the 2018 RH Outdoor Source Book. At more than 380 pages, this inspirational design resource presents one of the most expansive and fully integrated assortments of quality outdoor furniture, high-performance textiles and distinctive accents in the world. Chairman and CEO Gary Friedman has assembled some of the industry’s most respected designers, artisans and manufacturers to bring these new collections to life and showcase their work on the RH platform. Appearing on the cover of the new Source Book is the Paloma Collection by Mario Ruiz (Barcelona). An ode to restrained classicism, its distinct architectural sensibility is defined by clean lines and broad beveled planes that create a pure, geometric composition rendered in sustainable, premium solid teak or handcrafted aluminum. Shape and line combine in an expression of pure dynamism in Olema by David Sutherland (Dallas). A dramatic play of angles gives this teak seating collection a sense of simultaneous balance and movement, while a semi-reclined, raked back offers a striking note of counterpoise. Originally offered exclusively in teak, Sutherland’s celebrated Costa Collection – featuring the architectural motif of a mirror’s molded frame – has also been reimagined in slate aluminum. The Balmain Collection by Australia’s Nicholas and Harrison Condos features a modern minimalist design informed by the iconic arc of the Sydney Harbour Bridge. These masterfully crafted lounge and dining pieces are offered in both teak and aluminum. Among the season’s other highlights are the Positano Collection by designer Toan Nguyen (Milan), a bold sculptural collection in teak offering an overscaled interpretation of traditional basketry; Porto from Richard Forwood, defined by precise forms, generous proportions and a raked seat that floats within a broad plank openwork frame of solid teak; Nantucket, characterized by a classic simplicity and dynamic interplay of light and shadow with elegant forms clad in handwoven, all-weather wicker; and the recently introduced Clodagh Collection – now available in graphite grey. New accents include suspended Normandy lanterns from renowned designer Jonathan Browning (San Francisco), which create the illusion of floating candlelight; primitive drum-inspired Cosimo planters with textural crosshatch bands that evoke shifting sands, also from designer Clodagh (New York); sculptural Vetro side tables with diagonally etched patterns by Mitch Brean(San Diego); and tribal-influenced Java occasional tables hewn from single blocks of sustainably sourced Indonesian hardwood. Engineered with the finest marine-grade materials, Dougan Clarke’s (Miami) Tuuci® Eclipse Cabana, a stunning open-air pavilion with retractable shade canopy; Ocean Master Max Luna LED Cantilever Umbrella, with integrated, touch-sensitive dimmable LED lighting; and Ocean Master Max Tilting Cantilever Umbrella, featuring a state-of-the-art mechanism to provide coverage at every position of the sun’s arc, are all made in the USA. Complementing the global perspective are a range of enduring outdoor pillows – Sunbrella® Hanbel, reflecting centuries-old Berber motifs in textured stripes, diamonds and solids with fringe and tassel details; and Sunbrella® Kuba Cloth, evoking the rustic beauty and graphic appeal of traditional African ceremonial designs. This year also sees the introduction of contrast piping to RH’s custom pillow and cushion offerings. Rug designer Ben Soleimani’s (Los Angeles and London) High-Performance Outdoor Collection incorporates the same artistry and exceptional craftsmanship he brings to his signature indoor line. Meticulously woven from the finest handspun, all-weather fibers to achieve the rich texture and natural feel of wool, these one-of-a-kind carpets resist stains, spills and moisture. This release contains forward-looking statements within the meaning of the federal securities laws, including regarding presenting one of the most expansive and fully integrated assortments of quality outdoor furniture, high-performance textiles and distinctive accents in the world, and similar statements. You can identify forward-looking statements by the fact that they do not relate strictly to historical or current facts. We cannot assure you that future developments affecting us will be those that we have anticipated. Important risks and uncertainties that could cause actual results to differ materially from our expectations include, among others, risks related to the number of new business initiatives we are undertaking; our ability to introduce new products and merchandise categories that will be of interest to our customers and to new customers; as well as those risks and uncertainties disclosed under the sections entitled “Risk Factors” and “Management’s Discussion and Analysis of Financial Condition and Results of Operations” in RH’s most recent Annual Report on Form 10-K filed with the Securities and Exchange Commission, and similar disclosures in subsequent reports filed with the SEC, which are available on our investor relations website at ir.restorationhardware.com and on the SEC website at www.sec.gov. Any forward-looking statement made by us in this press release speaks only as of the date on which we make it. We undertake no obligation to publicly update any forward-looking statement, whether as a result of new information, future developments or otherwise, except as may be required by any applicable securities laws.